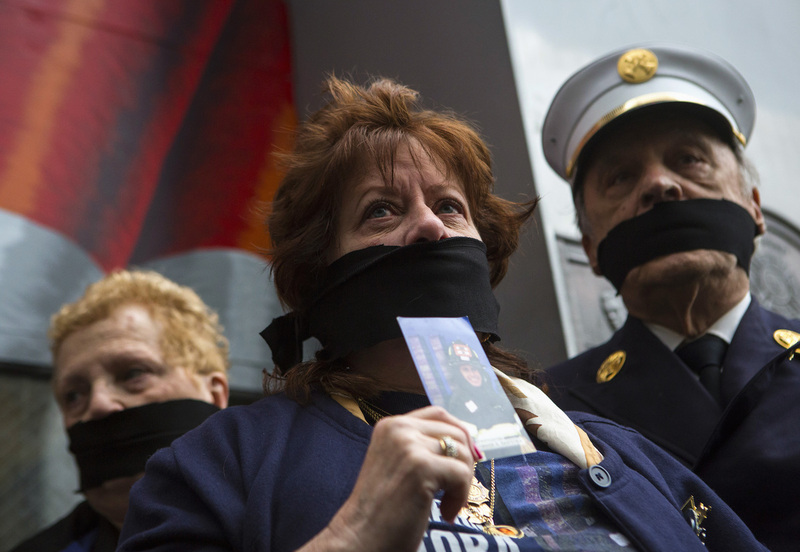 Unidentified Remains Of Sept. 11 Victims Returned To Ground Zero : The Two-Way Some family members protested the move by wearing black gags over their mouths. Others thought the procession and final resting place were appropriate. Family members of victims of the Sept. 11 attacks demonstrate against the decision to transfer the unidentified remains to a repository at the World Trade Center site. As a heavy fog lifted through the skyscrapers of Lower Manhattan, a procession began. Vehicles from the FDNY, the Port Authority and NYPD carried three flag-draped coffins filled with the unidentified remains of some Sept. 11 victims. The procession began at a medical examiner's office and passed by Ladder Co. 10, where firefighters paid their respects in formation. When the vehicles stopped at ground zero, the coffins were unloaded and placed in a special repository 70 feet underground in the same building as the museum scheduled to open May 21. The repository and the museum are separated by a wall and the remains will not be for public viewing, but some family members protested the decision to place them there. They wore black gags as they watched the procession roll by. "But other families supported the decision, and were critical of the protesters. "'I thought it was just ridiculous; everyone is too political over this,' said Lisa Vukaj, 34, as she left the plaza wearing a badge bearing a photo of her brother Simon Marash Dedvukaj, who was killed. She said she thought the ceremonial transfer was 'appropriate and fitting', and said, 'I just wanted to come and pay my respects, to be in the moment.'"